What is National Voter Registration Day? Since its inception in 2012, National Voter Registration Day has been supported by the National Association of Secretaries of State (NASS), which was later joined by the National Association of State Election Directors (NASED) and the U.S. Election Assistance Commission (EAC). How has National Voter Registration Day performed over the years? While the holiday has made progress over the years, that progress has not been linear. 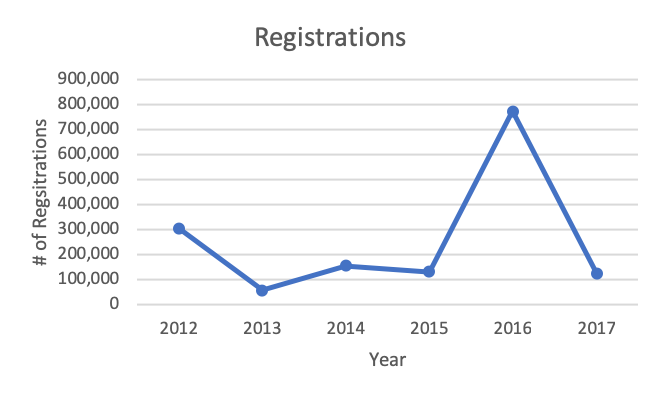 The number of registrations and volunteers has varied from year to year. Significantly less participation can be observed in off years than in federal general election years. The highest number of volunteers was reported in 2014, when 10,802 volunteers served at events around the country. 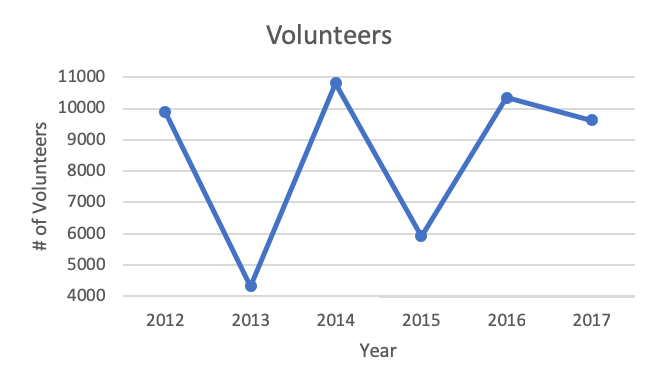 The number of registrations followed a similar pattern to that of volunteers. However, 2016 was by far the year with the highest number of registrations. That year, National Voter Registration Day reported 771,321 new or updated voter registrations. That was an increase of 467,711 registrations over the 2012 presidential election, which recorded 303,610 registrations. Interestingly, turnout in 2016 was slightly lower than 2012 (by about 0.7%).3 This might indicate that the rise in National Voter Registration Day registration numbers was more a result of increased visibility and capacities of National Voter Registration Day, rather than a more engaged populace. 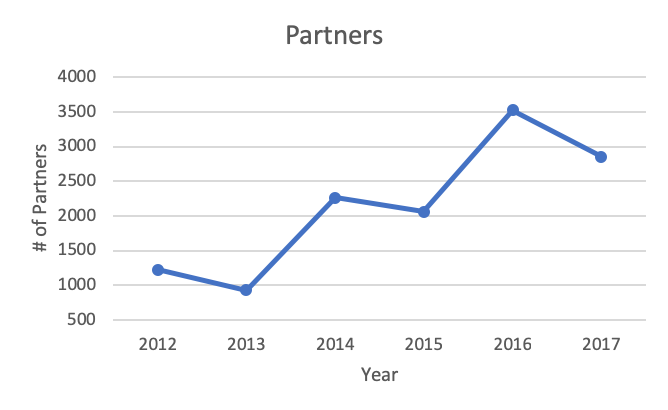 Perhaps the clearest indicator of National Voter Registration Day’s progress can be seen in the number of partners they’ve engaged throughout the years. Partners are “local organizations, businesses and election offices engaged in their own communities” as non-partisan event organizers who reach out and help people register to vote on National Voter Registration Day.4 The number of National Voter Registration Day partners has steadily climbed since 2012, with slight drop offs during each off-year. What can we expect from this year’s holiday? Since there is a federal general election this year, we might expect to see higher participation across every metric as compared to 2017. However, it seems unlikely that this National Voter Registration Day will be more active than 2016, since it is not a presidential election year. Want to find an event near you? Click here to use National Voter Registration Day’s event locator tool, or click here to learn more about the holiday. 1 “About National Voter Registration Day,” National Voter Registration Day, accessed September 24, 2018, https://nationalvoterregistrationday.org/about/. 2 “2017 National Voter Registration Day Final Report,” January 9, 2018, https://nationalvoterregistrationday.org/2017-report/. 3 Of the citizen voting-age population (CVAP), national average. U.S. Census Bureau, Table A-5a, Reported Voting for Total and Citizen Voting-age Population by State: Presidential Elections 1972 to 2016, accessed September 24, 2018, https://www2.census.gov/programs-surveys/cps/tables/time-series/voting-historical-time-series/a5a.xlsx. 4 “About National Voter Registration Day;” “Partner with Us on National Voter Registration Day,” National Voter Registration Day, accessed September 24, 2018, https://nationalvoterregistrationday.org/partner-sign-up/.